4.3. Additional loyalty tools in the German textile industry.. Figure 4: Welche Bonuskarte nutzen Sie regelmäßig . According to history Henry Ford mentioned with the introduction of the “Modell T” in 1908 that every customer could choose the colour of the car by himself as long as the chosen colour was black. He did that because black was easy to work with. Because of the non-existing competition during this time, companies did not have to operate towards consumer needs and were able to focus on the goods they produced. This chapter is an introduction to this thesis which analyses the topic customer card in the context of CRM but with specific reference to the German Textile Industry. The focus of this chapter is to present the problem definition of this thesis. 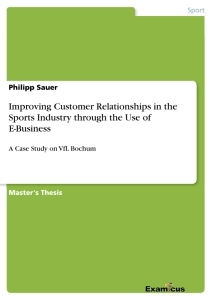 In addition, the objectives and structure of this thesis are outlined in this chapter. The mass of customer cards leads to the question, whether or not the market is saturated. This thesis tries to answer if customer cards are still an effective tool in CRM especially in the German Textile Industry. 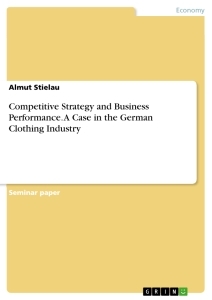 Because of the large variety of customer card programs in the German Textile Industry, it is difficult for the companies to stand out with their program compared to the competitors. For customers it is hard to choose which program to join, because all of them offer similar benefits. Besides, technology is moving forward which demands the classic customer card to be developed further into a digital tool with Omni channel possibilities. What does the market for customer card programs look like in the German Textile Industry? What are the differences between the competitive card programs? What are the opportunities and risks running a card program and what are the costs that come with a program? Why is the “Silver Generation” an interesting target group for a customer card program? What does the future of customer card programs look like and what needs to be done to stay on the market? This thesis is structured around seven chapters. The first chapter provides an introduction including the problem definition and key objectives of this thesis. 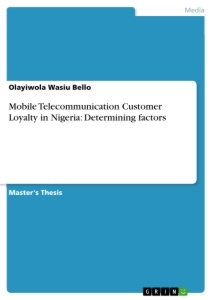 Chapter two addresses the history, theories and concepts of CRM with a focus on customer loyalty and customer needs. Customer satisfaction, trust, and commitment are also discussed in this chapter. Besides it gives an overview of the Customer Life Cycle and the different tools used for CRM. Chapter three presents the customer card itself. It describes the theoretical background and how the customer card made it to the German market. The difference between open and closed systems gets discussed as well as the main characteristics of a customer card program. At the end of this chapter the objectives are clustered and described. Chapter four gives an overview of the German Textile Industry. The customer card programs by Breuninger, Peek & Cloppenburg, and H&M are described and compared with each other. With a view to the controlling of a customer card program, this chapter also lists costs and returns that a company has to face when they offer this tool. Chapter five examines opportunities and risks of customer card programs. In this context the whole framework from the design, incentive structure, and service is mentioned. Data mining and the integration into corporate structure are issued in this chapter as well. At the end this chapter gives an overview about risks a company has to calculate with by running a card program. Chapter six pictures the commercial, social, and technical diversifications of customer card programs. This chapter can be seen as a future trend, showing off possibilities and technical development that might influence today’s customer card programs. The last chapter is the conclusion of this thesis which includes an overview of answers and findings of this thesis. After World War II the demand on the markets was high which caused a product- oriented activity by companies. Mass production was the key to success. The Ansoff matrix and the portfolio analysis were common use in the 1950s.3 According to Adrian Payne, the fundamentals of today’s marketing theories, like the marketing mix, were developed during this time. Product, price, place and promotion were defined; being the four mechanisms that influence the company’s success, if they were used the proper way. Relationship orientation was the new focus after the turn of the millennium. That orientation was based on the structure, the increase and the recovery of the relationship towards the customers. - Technical-functional bond: A functional context between core- and additional service leads to the technical-functional bond. In this case the customer is forced to use the same provider for both services even if they don’t need to be done at the same time. - Economical bond: Switching costs appear too high so the customer stays with the company. Those costs result from information- and initiating costs combined with financial and social risks and temporal expenditure. Figure 1: Types of bonds, according to Bruhn (2012), p. 106. CRM can be divided into two clusters – analytic and operative CRM (aCRM/ oCRM). The operative side contains the direct contact to the customer like in marketing, distribution and service. It controls and supports the communication between company and customer. An operative customer data base is needed in this process. Content management systems create a user-optimized surface to make the handling of the data easier. Those systems support the processes by integrating information like graphics or videos into the data base. The main focus is to document customer contacts in a chronological order to provide Campaign Management (CM) with the needed information. Those results can be used by CM to contact the right customer with the best offer using the appropriate wording and the best channel at the right time. Table 1: Main reasons to switch to a competitor, according to Hartmann, Kreutzer, Kuhfuß (2004), p. 11. Trust or commitment means the customers’ willingness to believe in a company and its actions without checking them. It is an ongoing process which is built by satisfaction and quality of service.18 In the past years companies tried to reach out for customers by focusing on their product presenting their Unique Selling Proposition (USP). Since trust became more and more important companies changed their approach from “Take the money and run” to “Make the customer happy”.19 According to literature trust is very important when it comes to modified rebuys in differentiation to straight rebuys. The uncertainty rises with every buying transaction and modification in the object of purchase. - Customer Lifetime Cycle – Customer needs depend on his age and the stage the customer is at. - Customer Episode Cycle – Repeating actions in a period of time makes it easy for a company to divide the relationship into several clusters and get in touch with the customer easily. The following figure will demonstrate the different stages a consumer passes through during his life, starting as a student. This figure focuses on the period in life were people are part of the working population and ends with the stage were people retire. Figure 2: Customer Life Cycle, according to Bruhn (2015), p. 62. In the stage of acquisition, customers collect information concerning the company. Meanwhile the company uses communication strategies to catch consumers’ attention and to suggest quality in service and products. This stage ends by a purchase through which the consumer gains information about the service and the quality of the company. The company gets information about the customer and is able to use those to create a profile. For a company this stage is expensive because the costs to gain new customers are superior. The retention stage is the stabilizing stage. Now the company has the chance to raise the customer average sales by cross- and up-selling. Once the peak is reached, it is important to keep the customer at this level of returns. This can be done by offering further services or products, which will gain the company’s profit. 1 Haag (2010), p. 8-17. 3 Bruhn (2015), p. 1. 4 Payne (2005), p. 28. 5 Bruhn (2015), p. 2. 6 Payne (2005), p. 28. 7 Bruhn (2015), p. 2. 8 Hippner, Hubrich, Wilde (2011), p. 18. 9 Meffert, Burmann, Kirchgeorg (2010), p. 860. 10 Töpfer (2008), p. 37. 11 Meffert, Burmann, Kirchgeorg (2010), p. 60 f.
12 Bruhn (2012), p. 95-97, 108. 13 Bruhn (2012), p. 106, 107. 14 Hippner, Hubrich, Wilde (2011), p. 38 f.
16 Bruhn (2015), p. 86. 17 Töpfer (2008), p. 38. 19 Töpfer (2008), p. 41. 20 Bruhn (2015), p. 89 f.
21 Foscht, Swoboda, Schramm-Klein (2015), p. 241. 22 Bruhn (2015), p. 95. 23 Töpfer (2008), p. 90. 25 Bruhn (2015), p. 60. 26 Trommsdorff (2009), p. 202. 27 Bruhn (2015), p. 64. 29 Bruhn (2015), p. 64-71. 30 Dittrich (2000), p. 15. 31 Aßmann, Werg (2008), p. 10. 32 Trommsdorff, Teichert (2011), p.320.